les toits de Saint -Malo ! Libouton Martine (Bousval, Belgium) on 11 March 2019 in Landscape & Rural and Portfolio. High drama here for sure - amazing effect. Lovely capture with the backdrop of the jet trails !! A stunning image !!!! Encore un bon travail de post pour un superbe rendu visuel ! Certes, tu as saturé les couleurs et les contrastes, mais même au naturel, c'est impressionnant ! Très belle photo, mais je sais, je me répète. Comme des lasers pour mettre en valeur cette architecture ! très beau cadrage et traitement ! Surréaliste avec ton édition.... ! Belle post production le rendu est superbe. Lots of traffic in the sky!! Awesome treatment and tones! Waaaauw...this is very very special !! Beautiful facade with excellent architectural order! I love that dynamic sky with the contrails. Un ciel tentaculaire, une photo tip-top ! Oh...Y'a du vent ....Superbe traitement . Wow! That sky is amazing. Il y a du passage au dessus de ces toits !! :) superbe rendu ! Un traitement de l'image impressionnant ! The roofs and the dramatic sky! High drama. Amazing the dramatic from the colors and the lines from the planes in the sky. Magnifique photo, bravo j'adore !!!!! 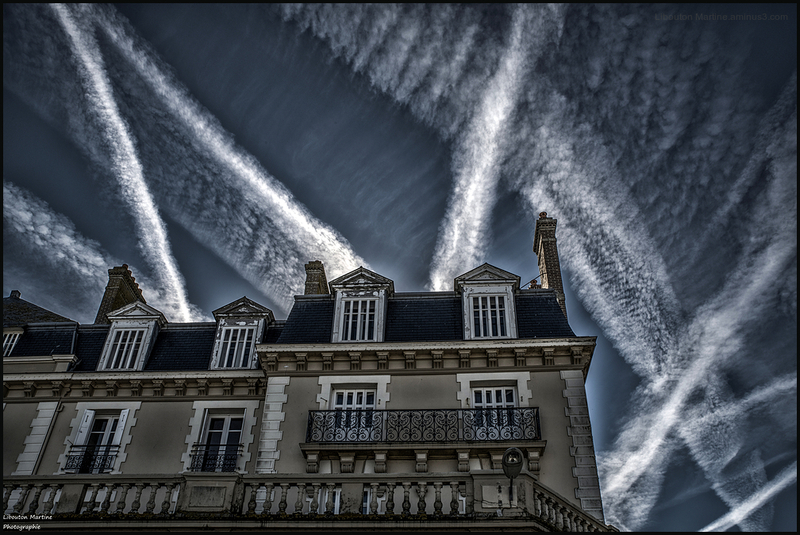 That's a cool photo with all the contrails creating interesting lines over the building. Well, THIS is Absolutely Awesome!!!! Excellent use of the smoke line of the airplanes. Génial, un petit chef d'oeuvre de plus à ton actif.